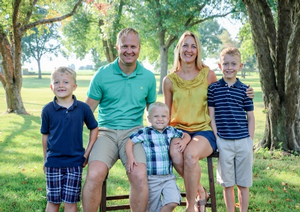 Kurt and Emily Rietema live with their sons, Luke, Perkins, and Leo, in a diverse, under-resourced neighborhood of Kansas City, KS, called Argentine. Kurt leads Christian community development efforts for the CRC in their neighborhood and is also the Director of Justice Initiatives at Youthfront. Youthfront has youth leadership development programs in the neighborhood including Imagine Argentine, a youth social entrepreneurship program. This program brings together local middle and high school students to bring creativity and entrepreneurship to bring heaven on earth to the most pressing problems facing their community. One of the youth ventures that was launched is called Snack Shack KC, where young people created a social business in an empty storefront to provide a safe place for kids to hang out after school with snacks, drinks and friends. Kurt also leads Youthfront Missional Journeys, which are a different kind of take on service projects and short-term missions. While there are work projects in these Missional Journeys, the real focus is not to address the symptoms of poverty in our world, but to educate youth understand the systems that perpetuate it so we can thoughtfully enact the story of God among broken people and places. Emily leads a just housing initiative called "Neighbor to Neighbor," which helps place immigrants and other marginalized people into below-market rentals with the ultimate goal to move people into home ownership. "Neighbor to Neighbor" creates just, low-interest lending partnerships between churches and families that can’t access traditional home mortgages. New homeowners have seen their monthly payments cut in half and on the path to being homeowners in 7-15 years. The Franklin Center is another project the Rietema’s have led in creating a new ministry center in an historic, but abandoned school building. Kurt has helped convene many different ministries from a Christian health clinic to youth ministries to bring new life to a blighted part of Argentine. In asking what it means to truly love their neighbors as themselves, the Rietema’s have found out that their neighbors don’t have the same rights and opportunities as the rest of us. Because of the broken immigration system in the U.S. — whereby our economy depends upon immigrant labor but we have not created legal pathways to keep up with that demand — many immigrants’ lives are in limbo. Loving others in the way of Christ, they have found out, means not simply responding to their immediate needs, but also to organize and structure our society and our laws so our neighbors don’t find themselves marginalized or in poverty. Part of Kurt’s ministry has been to help Christians think about immigration primarily through a theological lens and only secondarily through our political and economic allegiances. At the heart of their ministry is a Wednesday night Bible study where the Rietemas gather neighbors together to read scripture together to lead and guide their communal life together. Ultimately, it is their hope that a church for, with, and of the community with grow from these times of prayer and scripture reading. Kurt & Emily Rietema's stories of life and love in the Argentine neighborhood of Kansas City, KS, in their blog.